A czarist-era Russian love story inspired this popular Soviet salad. Named after the classic early 20th century Russian novel, the delectable garnet bracelet salad has been a dazzling decoration on Russians’ festive table for more than a half-century. The garnet bracelet salad owes its name to a famous short novel written in 1910 by the Russian writer, Alexander Kuprin. The main female character, duchess Vera, receives a rare and precious garnet as a present from a long-time secret admirer, which of course is an unpleasant surprise of her husband and relatives. The garnet bracelet was the symbol of unrequited love in Kuprin’s story and gave a dramatic title to this novel. Lovers of Russian literature who were also culinary enthusiasts memorialized this novel in a salad, because it reminded them of the jewel in both color and form. The name of this salad is a play on words because the Russian word for pomegranate and garnet gemstone are the same – «гранат» (“granat”). Thus, the salad’s name contains both a reference to Kuprin’s novel and to an important ingredient in the salad recipe. 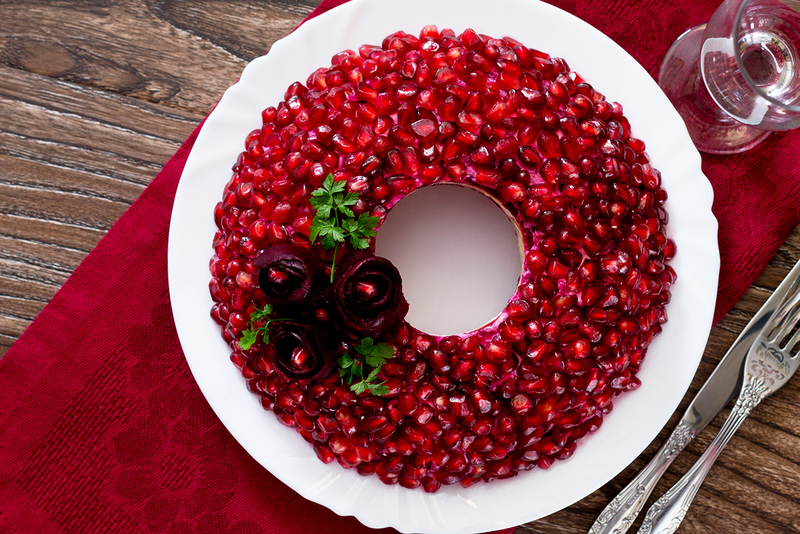 The pomegranate seeds give the salad its bright festive look and exquisite taste. Garnet bracelet has much in common with another traditional Russian dish, dressed herring, but the salad’s original form and topping make for a more exquisite image. Garnet bracelet salad first appeared in Soviet times, soon after the adapted screenplay of Kuprin’s novel in 1964. The era of Russian nobility, with its culture and strict rules of honour, had already been left far in the past, but Kuprin’s romantic story continued to attract minds and souls, and every book-loving cook could pay a tribute to the novel by making this original dish. 1. Cook the chicken breast, potatoes and beetroot in separate pans. The chicken breast and beetroot should be cooked for 40 minutes, and the potatoes for 20 minutes. While these ingredients are cooking, dice the leek and dress it with a teaspoon of boiled water and 2 droplets of vinegar. Instead of water and vinegar, you can also use a teaspoon of soy sauce. The leek should be pickled for 10 minutes. 2. Peel the cooked potatoes and grate them, adding a pinch of salt. The potatoes will be the salad’s first layer. To maintain the original form, place a glass in the centre of the dish. Spread the grated potatoes around the glass, cover them with mayonnaise; the following layers should be placed in a similar fashion. 3. Put the pickled salad leek onto the potatoes, and cover it with mayonnaise. Chop the chicken breast, adding salt to taste, then put it onto the salad leek layer that covers the meat with mayonnaise. 4. Peel the cucumber, grate it and add a pinch of salt. Put the cucumber onto the chicken as the next layer, and cover it with mayonnaise. 5. Peel and grate the beetroot. Finally, grate the garlic and chop the walnuts, mix them with the beetroot, adding salt to taste. Put the mixture onto previous layers. 6. Top the salad with pomegranate seeds, completely covering all previous layers. Now remove the glass, and the salad is ready to be served.